The Washington State Department of Licensing has medically suspended all 24 athletes who competed in Saturday’s “UFC on FOX: Johnson vs. Moraga” event. The majority of the roster received mandatory seven-day bans. However, several fighters could be riding the pine for as long as six months. John Moraga (pictured), Bobby Voelker, Danny Castillo, Mac Danzig, Ed Herman and Aaron Riley were each issued 180-day suspensions, but can return to action sooner with a doctor’s note. UFC on FOX 8 took place inside KeyArena in Seattle, Washington. 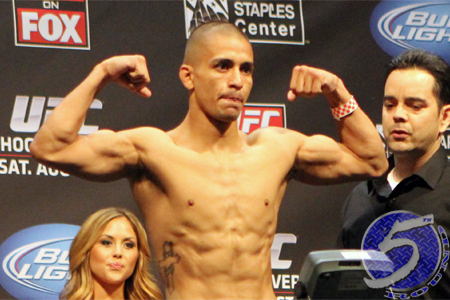 John Moraga: Suspended 180 days unless cleared by doctor. Minimum 30-day suspension. Bobby Voelker: Suspended 180 days unless cleared by doctor. Minimum 60-day suspension. Jessica Andrade: Suspended 45 days unless cleared by doctor. Minimum 30-day suspension. Michael Chiesa: Suspended 180 days unless cleared by doctor. Minimum 30-day suspension. Danny Castillo: Suspended 180 days unless cleared by doctor. Mac Danzig: Suspended 180 days unless cleared by doctor. Minimum 30-day suspension. Ed Herman: Suspended 180 days unless cleared by doctor. Trevor Smith: Suspended indefinitely until cleared by a doctor. Minimum 30-day suspension. Germaine de Randamie: Suspended indefinitely until cleared by a doctor. Minimum 30-day suspension. Justin Salas: Suspended 45 days. Aaron Riley: Suspended 180 days unless cleared by a doctor. Minimum 30-day suspension. Yaotzin Meza: Suspended seven days. John Albert: Suspended seven days.